We’d love your help. Let us know what’s wrong with this preview of Rewriting by David Michael Kaplan. To ask other readers questions about Rewriting, please sign up. As an author, I'm not into books about writing. Instead, I prefer to read a wide cross section of fiction, to gain insight into what works and doesn't work. However, something made me open this book by David Michael Kaplan during National Novel Writing Month, a time when I was slamming out words and resisting the urge to edit. This might seem like odd reading material to have chosen to read during this particularly intensive writing challenge. In fact, it proved most exhilarating, as the author g As an author, I'm not into books about writing. Instead, I prefer to read a wide cross section of fiction, to gain insight into what works and doesn't work. However, something made me open this book by David Michael Kaplan during National Novel Writing Month, a time when I was slamming out words and resisting the urge to edit. This might seem like odd reading material to have chosen to read during this particularly intensive writing challenge. 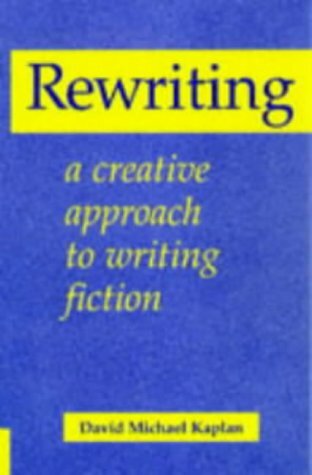 In fact, it proved most exhilarating, as the author gives you permission to write with no-holds barred for a first draft; you can slam the story out in whatever order you like, waffling to your heart's content, telling rather than showing, wadding it with exposition, and indulging in all manner of other writerly sins. Yay! Freedom, freedom, freedom! Yes, yes, you can even use as many exclamation marks as you wish!!! The author, who is a professor of English and conducts fiction writing workshops (or at least he did back in 1998, the date of the edition that I own), has taken samples of his own writing and that of his students to illustrate the revision process through several drafts to the polished end product. He has a very unpompous and congenial way of illustrating his points and doesn't seem to mind at all about dissecting his own work or laughing at himself. I found this a most encouraging and worthwhile book. In particular, it proved to me that there was plenty more I could still do to improve some of my earlier novels and make them saleable if I should so wish. But most important of all, it has filled me with enthusiasm at the prospect of reaching the end of the first draft of my work-in-progress and trying out some revision techniques that I haven't tried before. This is the road map I needed!